Ah, the last of the summer peaches are fading from the markets. But back when they were abundant and cheap, I made this cake several times this summer, and it capped our tripartite dessert for the pig roast at the Great Western Casa McBardo. 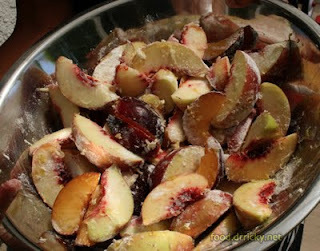 Along with the chai ice cream, we grilled some fresh ripe while freestone peaches. And this peach "cake". Or is it a clafouti? 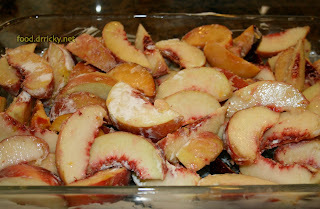 Basically, you toss the peaches (and the occassional plum... or any handy fruit) with some cornstarch (or flour) and sugar, and layer onto a buttered baking dish. I mixed up a quick batter (slightly thicker than pancake batter) flavored with vanilla, and poured it over the top, dotted with butter, before baking in a hot oven. Resulting thing was devoured so quickly we don't have photographs. But word has it that memories of the peach upon peach upon chai combination still ring on months later.